That one guy. It was Jimmie Johnson in 2007. After a somewhat non-descript season, it was Tony Stewart in 2011. Brad Keselowski was that one guy in 2012. That one guy in NASCAR circles is that one guy who finds a higher gear come what we now call playoff time. This season, it sure looks like Kyle Busch may be that one guy. Save for circumstances beyond his control at Chicagoland Speedway, Busch has been beastly, adding his name to a list that includes Martin Truex Jr. and Kyle Larson of serious contenders for the 2017 NASCAR Monster Energy Cup Series title. Dare we say it? 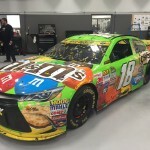 Kyle Busch just might be the favorite. Why would I say that? 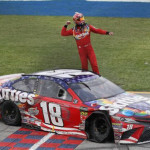 I would point to how Kyle Busch got the win. Just when we thought Chase Elliott would capture his first career Cup win, along comes Rowdy, recognizing the surroundings and his opportunity to take the win. Champions find a way. That will be the competitive edge for Kyle Busch, he’s done this before. Truex and Larson are winners, but the 2015 champion has a deeper resume. It’s for that reason, you can’t count out Jimmie Johnson. 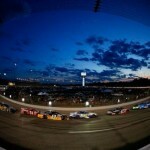 There’s plenty of racing yet, and let’s not forget he finished third in Sunday’s race at Dover. He’s been that one guy before, and he has the means to pull it off. The way things are going, this could be one of the most competitive home stretches the series has seen in a while. 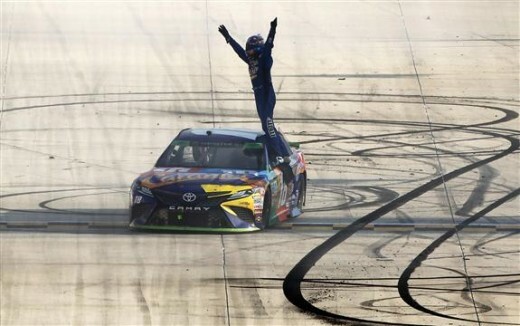 Truex and Larson have been consistent week in and week out, and they have a gaggle of playoff drivers surrounding them who can get hot, backed with enough success already to have more than just a puncher’s chance. Who will be that one guy who peaks at the right time and takes control of his destiny. Right now, it would appear that Kyle Busch is that one guy. It’s Racing Like You’re Being Raced Right?